Even for The Mole, there has almost been surplus coverage of the Heineken Cup final in Twickenham. Ulster and Leinster have been analysed, examined and dissected in such depth that it is very difficult to consider any angle that would contribute anything further in the search for clues as to which team might have the ascendency in this game. So, put yourself in the place of Brian McLaughlin and David Humphreys, someplace in Portugal last week where they got to talk about selection and, in particular, selection of No16 – No23. Firstly, who do you want to avoid replacing? Ruan Pienaar, your goal-kicker and general; John Afoa, who is so much more than a scrummaging tighthead; and Rory Best, the talisman. Ulster have played a lot of games without Stephen Ferris, and while he’s a magnificent player that any team would miss, they’re sort of used to him not being there. Having watched a number of important Ulster games this year – Munster, Leicester, Clermont, Glasgow – The Mole’s view is that there are a further three players in particular whom the Ulster management hope will stay on the pitch for the full eighty minutes: Terblanche, Wallace and Henry. Stefan Terblanche – he lacks the pace that he showed on his Springbok debut fourteen years ago, but he uses all those years of experience to make sure that he’s never put in a position where it’s put to the test. For a thirty-a-lot, full-back Stefan Terblanche has been a godsend to the Red Hand. With his excellent positional sense, a kick like a mule and the ability to pick the lines of running that capitalise on poor defense [or put his quick wingers away], Terblanche has been a wonderful acquisition for a pick-up replacement and one that everybody in camp hopes will see out the full eighty. If he didn’t, his replacement would probably be Adam D’Arcy, scorer of a couple of wondrous tries this season, but still a long way behind his South African counterpart. D’Arcy looks the part, but doesn’t inspire his team-mates in anything like the way that Terblanche does. Guaranteed at least one major howler per game of 80 minutes, he often seems like he is trying too hard to impress. Jonny Sexton would be delighted to see him pulling off his track-suit, but not many Ulster men would be standing up to welcome him. Paddy Wallace has literally shadowed Gordon D’Arcy and Brian O’Driscoll for more than a decade in Irish rugby. 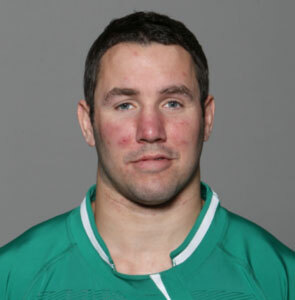 A little remembered fact is that Leinster signed Wallace as a short-term replacement way back in 2003 after their quarter-final victory against Biarritz, when they had qualified for a home semi-final against Perpignan. The boys in blue famously blew the opportunity and so Wallace, who was student in Trinity College Dublin at the time, never stood on the stage long enough to see could he fit into the collection of galacticos which included Denis Hickie, Shane Horgan and Girvan Dempsey. Paddy Wallace – takes a lickin’ and just keeps tickin’. He’s even more important to Ulster with young Paddy Jackson at No10, giving the talented nipper a second distributor and kicker one out. Wallace is a brave defender – crazy brave. He tackles on both shoulders, but primarily with his head and face if the number of stitches he has picked up over the years is anything to go by. A stylish attacker, Wallace creates line breaks without quite having the pace to make his escape from the cover defence. He creates space for his partners – Cave in this instance – and has a range of kicks which reflect his experience at No10. At 32 years old, he looks like he’s really enjoying his rugby this season, just like last season … he’s coming to the end of his career and maybe he feels the pressure is off. His replacement if he had to come off? Big question. Do you bring in the weak-tackling Iain Humphreys at inside centre, or does Andrew Trimble come in off the wing, a move that would shore up the defense but dampen the outside threat? Once again, it’s the suspicion of The Mole that were Wallace to have to leave the game early on Saturday, the groans would sound out from the Ulster fans. 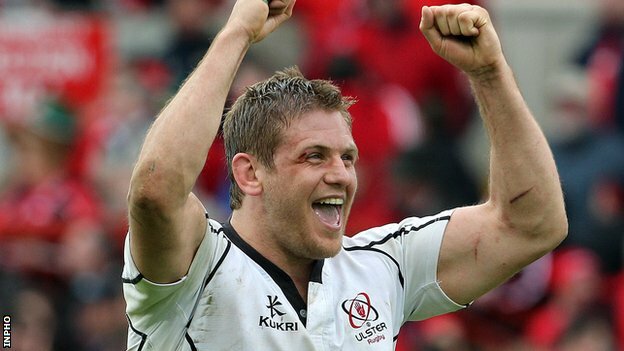 Chris Henry has successfully reinvented himself as an openside and turned himself into a more vital player for Ulster than he was in his favoured position. Fair play! The third man in this category is Chris Henry. The major problem that Humphreys and McLaughlin would have considered in selecting their bench is that the two candidates, Diack and Faloon, have totally different skill sets. Faloon has had his chance to nail down the No7 slot and couldn’t take it, although he looked every bit as talented as Niall Ronan a couple of seasons ago. Diack, eligible to play for his adopted country since June last year, is a ball carrying No6 or No8 more than an open-side fetcher and linker. He lacks the guile of Henry and can be caught out of place and isolated in big matches. Losing Henry – at least before 50 minutes – would be a game changer for Ulster. They have nobody remotely as skilful as him at getting to the important breakdowns quickly and securing, or slowing, the vital ball. Heineken Cup Finals are intense affairs, rarely spectacles with tries abounding. There have been some exceptions but, given the defensive strengths of both units, it’s hard to see where five-pointers will come from except mistakes. There will however be collisions – lots of collisions – and thus almost certainly a few substitutions. Leinster have depth and a range of skills on the bench that will present new challenges for Ulster if they have to unload their bench. Ulster chose not to use the bench at all in their Thomond Park bruiser. If they have to do so to replace the three players mentioned earlier it could swing the balance significantly. This entry was posted in Heineken Cup, Opinion and tagged Adam D'Arcy, Chris Henry, Heineken Cup, Ian Humphreys, Paddy Wallace, Stefan Terblanche, Ulster, Willie Faloon by dementedmole. Bookmark the permalink.